Editor’s Note: This is the fourth installment of our 2013 review & preview series. You can read the rest here. Despite a tumultuous season at the position, first base actually turned out to be a pretty productive spot for the Brewers in 2012. Last season was supposed to be Mat Gamel’s time to shine. Things hadn’t gone so well in his smattering of prior opportunities as a utility player, but this was the first time Gamel could finally claim a position as his own. We were bullish based on his minor-league success, projecting him at a .284/.346/.500 triple-slash line over a full season of work. That, of course, all went out the window when he shredded his ACL in early May, ending his season after just 70 at-bats. Practically a full season removed from this disaster, I often hear people speak glowingly of Gamel’s brief starting stint in 2012. This is almost certainly a case of rose-colored glasses; over 21 games, Gamel hit just .246/.293/.348, a far cry from his much healthier minor league .304/.376/.498. Absence makes the heart grow fonder. Fortunately, a relatively obscure offseason signing provided the perfect contingency plan. When the Brewers brought Norichika Aoki over from Japan, they thought they were getting a fourth outfielder. But Aoki’s play begged for more opportunities, which Gamel’s injury provided by allowing RF Corey Hart to shift to first. Defensively, this move should have accommodated Hart just fine, as he had always been at- or below-average in RF. And Hart looked fine at first, from what I saw. But the numbers paint a different picture, suggesting his only positive value defensively came from his ability to prevent errors. Offensively, Hart put up one of his typical Hart seasons, batting .270 with 30 home runs and an .841 OPS. Put together, Hart was a solid 3-win player in 2012. Unfortunately, neither Gamel nor Hart will be manning first base on opening day. Both are recovering from injuries; Gamel’s was season-ending. Hart is slated to return from knee surgery sometime in May. Until then, you’ll see plenty of Alex Gonzalez (who doesn’t like the position, hasn’t often played it, and doesn’t have a great bat) and Martin Maldonado (who also has not played it and doesn’t have a great bat). Yikes. Hart will be a free agent after the season. Rumors of an extension have been thrown around for years, but this is probably not likely given the recent Carlos Gomez extension and Kyle Lohse signing. It will be interesting to see what the team’s plan for first base is this offseason. 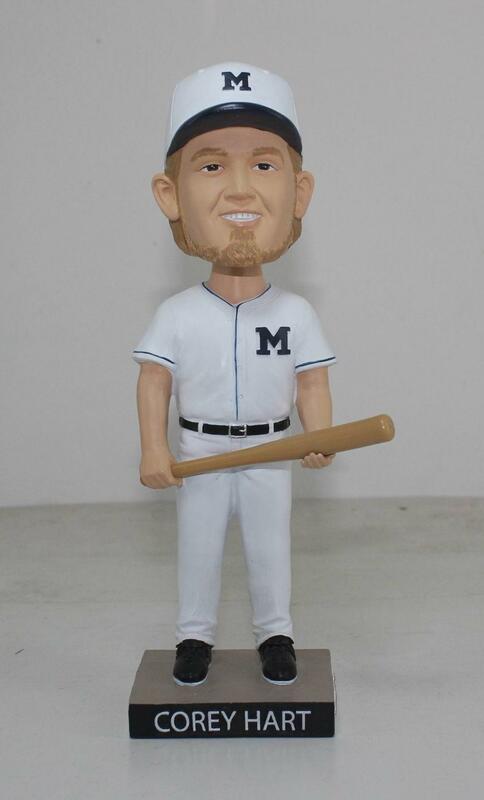 Corey gets his own bobblehead in 2013, which looks nothing like him. This entry was posted in News and tagged 2013 Milwaukee Brewers, 2013 Position Review & Preview, Corey Hart, First Base, Martin Maldonado, Mat Gamel. Bookmark the permalink.